After 2 hours driving on old high way 1A to starting point. Right here, all bikes are ready for your cycling adventure in Mekong Delta. Off-roads cycling with well-trained bike guides from Vietnam Backroads Bike Tours will give you more time to understand local inhabitants of gardening villages. All unique routes in the afternoon enables you to take time to ride on narrow paths with kids finished from schools. Your guides is also telling you about education system in Mekong Delta's countryside. Stay your first night in town of Tra Vinh. In the morning of your cycle ride is to bike on foot paths through ride fields. Many narrow paths just enough for bicycles and mopeds crossing rice paddy fields which linking villages to villages from Tra Vinh to Cau Ke via Tieu Can. These routes allow you to ride pass traditional villages of Khmer, most of people here still keep their own traditional way of living style. Thatch houses are still popular used and associated within Khmer communities in Vietnam. Stopping at some colorful Khmer Buddhist temples, right here our bike guides will tell you the big difference between two branches of Buddhism. One is Mahayana and other is called Theravada. Continue your bike adventure in the afternoon with exploring tropical fruit orchards and mingle with crowd on bike on islands of grapefruit, longan and orange. The afternoon' cycling gives you an opportunity to share space with locals on small ferry through bendy natural creeks to outskirts of Can Tho city. A 30 minutes transfer will take you to hotel for beers for beer! After you observing farmers selling and exchanging farm products from boat to boat at lively floating market of Cai Rang, we will carry on our adventure trip with bicycling to Chau Doc. The morning cycling adventure is to explore undiscovered countryside, pedal past bucolic settlements of networks of irrigation canal. After lunch, we cycle past bucolic settlements and vibrant green rice paddies on wonderfully quiet tracks to stork garden. Enjoy an hour and half driving on A/C van to Chau Doc Dist via Long Xuyen city. Your bike adventure of today is to explore a low-level plain as Dong Thap where house on stilts mostly seen on all the way to Cao Lanh. Have an hour boat to see fish farms which is also the floating villages along Basac River. Experience a cycling through small rural communities of Muslim. Stopping at Monastery and sharing the country road with local scooters to work and kids biking to school. Travel on bike through peaceful, seemingly undiscovered rural villages among houses which built on stilts with local materials. Stay a night in none tourist city of Cao Lanh. Dat is a fantastic guide. He is friendly and knowledgeable. Driver is safe. The route taken is good with a variety of scenery. The bikes are good quality and easy to ride. Recommend cycling early in the morning- the heat is very bad in the middle of the day. Frozen water in bottlles might be good to help with the heat. Hotels should serve espresso coffee. I wanted to thank you for arranging the most wonderful bike trip for me and my son, Ian. It was exactly what we had hoped for - beautiful scenery, great food, wonderful people, manageable biking and the best guide ever. It was a very meaningful trip for us, for many reasons, all enhanced by Dat’s wise and spiritual guidance. We were not ready for the trip to end. Thank you also for helping us arrange transportation to the Wild Gibbon Tour, which was quite an adventure. Recommend cycling early in the morning- the heat is very bad in the middle of the day. Frozen water in bottles might be good to help with the heat. Thang was an excellent guide! Fun accommodating, very considerate and hospitable. We had a great time exploring the Mekong Delta and learning a bit about the region. Very good tour. would recommend some tuition on riding over bridge + road awareness a bit especially for novice riders. I would never have done this on my own so very happy I did. Bike excellent packing up of tour very good, professional services eg. Baggage handling. Dear Miss Hue, we want to thank your team at Vietnam Backroads, for a most enjoyable tour in April. Our guide "Buppy" (hope our spelling is right) was really great and our driver Duc. Everything was really good. Thank you for returning our money from the Duxton hotel. 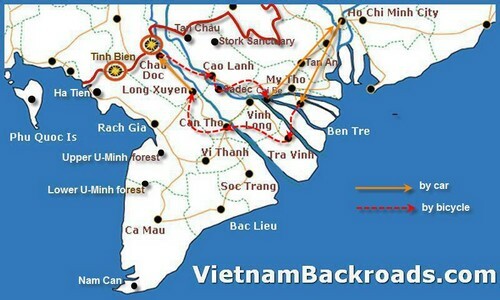 We will certainly recommend Vietnam Backroads as a great company to bike with.